Literally! This is what some of the sick minds within chavismo wish for the owners of Globovision owners (and the owners of other media, by the way). The momentum against Globovision within chavismo is growing, the more so that Globovision reports with increased frequency the misdeeds of the chavista public officers that lost reelection last November. The loot seems to have been even greater than expected. Not to mention the increased dissatisfaction of public employees that are owed weeks and months of salaries and bonuses, thus protesting constantly. When it is not health care staff at public hospitals protesting because the state does not protect them against the anger of their patients' relatives who try to kill them when they could not save their parent. This is how degraded the country mood has become, doctors are robbed and killed on the job. All seen on private media of course as on state multiple media services you would believe that we are in a prosperous socialist Switzerland or something. Even the chavista hoi polloi seeks Globovison cameras to declare now, instead of throwing stones at its journalists. But where the degradation is more advanced is in the mind of chavistas who subjected to constant ideological pressure from Chavez and his Cuban associates and Venezuelan converts are losing any sense of proportion, any contact with reality, any notion on how things actually work in semi civilized societies. The new threats against Globovision today are noteworthy not because of the threats themselves, but about what they tell about the chavista who utters them. The vice minister of communication, Mauricio Rodriguez, declared, in all seriousness on state TV VTV , that the owners of a media conspiring on a coup deserved death. And he used Chomsky as his back up on an hypothetical situation in the US. (Note: 'used' Chomsky, not 'cited' him, alleging that the guy had said it in some interview). In addition he went ahead to state that Ravell was not able to direct Globovision the way he did, that he was receiving orders from elsewhere. Apparently the official line is that if the good people were left to their own devices they would all love Chavez. You can find the note on Globovision web page here, and if you hurry they might still have the video available for free here (look for the one that says: nacional @ globovision viceministro del minci habla sobre pena de muerte). Now, let's assume for the sake of the argument that what Mauricio says is true. First, if Globovison has been plotting against Chavez since at least 2002, how come it is not on trial anyway? If the guilt is so obvious, how come Ravell (and his bosses?) are not already rotting in jail? What does that say about the prosecutor office of Venezuela? And the arguments against Globovision? Second, the obvious, there is no legal death penalty in Venezuela. So, why mention it instead of saying plainly they should be sent to jail for the rest of their lives? The maximum sentence being 30 years, for Ravell and his bosses ages that would be tantamount to life in jail. Or is this a lapsus brutis of these people who when talking among themselves caress ways of really, but really getting rid of the opposition? Third, to the ridiculousness, and intellectual dishonesty, of bringing casually Chomsky to collation we could add that media would be hard pressed to direct a coup in countries like the US or Europe even if they were so inclined. True, they love to try to manipulate public opinion, but from there to imagine such a scenario is simply silly. 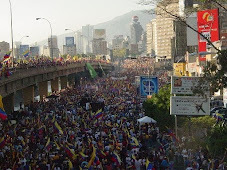 And this is also true inside Venezuela where Globovison today only covers in open broadcast Valencia and Caracas areas. That is, way less than half of the country. If chavismo truly thinks that with that Globovision can direct a coup, then they are really in trouble and/or suffer from severe lack of self confidence. And last but not least: last time I checked there was absolutely NO WAY to force people to watch Globovision in Caracas and Valencia, and no way to force people to get cable to TV elsewhere to force them to watch Globovision. Why is the government not asking the right question: why are people going to great length to watch Globovision instead of watching VTV or even TeleSur? I was wondering about Mauricio as I watched the clip repeated endlessly by Globovision. I was struck by his pose and his rather unwashed style considering he is a vice-minister (I am not asking him to wear a tie, not even to be clean shaven, but to appear as if he at least got a shower this morning). I did look for other pictures of him and he does look neglectful of his image, very revolutionary in a way, but of the cheap type, the ones without any style. So I am putting a second picture of him because I am pretty sure that he is going to gain promotion after today, as Chavez tries to place potential killers in key places for the oncoming repression. You need to know who this guy is, a deeply indoctrinated, probably to the point of brain washing. Observe also that in this picture he is unable to look straight at the camera, just as in the video taken in friendly VTV. But I am not going to start on the psy implications of this observation. Just to conclude this post, do not think that Mauricio is a lose canon: he is part of a concerted offensive. Today you had for example Adam Chavez himself saying that shutting down privately owned media is not a violation of freedom of expression. Which can only mean that Globovision is not the only target of chavismo, just the first one to go down in this new repressive wave (probably RCTV radio, CNB and Union Radio are targets). The Interior Minister Tarek El Aissami chimed in saying that one media had become a matter of public health. Again, who is forcing people to watch Globovision? And I would like to add that Tarek would do well to watch Globovision to get the news he needs to fight crime since apparently he has no clue as to what is going on in Venezuela streets. Not to mention that it could also improve his very deficient vocabulary and poor grammar. Again, not that I demand that he speaks as an academic, but sometimes it would be nice to get what he is talking about. But get ready for more hard talk and chavismo obscenities (real or stylistic, it does not matter). The Interamerican Court has just served more papers to the Venezuelan state demanding to know why it did not reply to previous inquiries and rulings, and why it was prosecuting a lot of people in addition to Globovision. Apparently chavismo has decided not to account to anything, just as the neighborhood thugs or mafiosi, who never feel compelled to explain themselves. This is going to become really interesting.